David Talbot of Dundee Capital Markets forecasts uranium demand growth of about 6% compounded annually through 2020, which ought to be more than enough to kickstart depressed U3O8 prices. Nuclear energy is part of a growing trend away from fossil fuels toward green energy and things like lithium-ion batteries for cars and energy storage. Talbot explains that lithium demand is expected to grow even faster than uranium demand, and the market is already undergoing a supply deficit. In this interview with The Energy Report, he offers his top picks in the uranium and lithium spaces, as well as a graphite name, all poised to ride the green energy trend higher. The Energy Report: Global uranium demand was about 172 million pounds (172 Mlb) in 2014, according to the International Energy Agency, but you have written that the commissioning of new reactors in China and the restart of reactors in Japan following the long shutdown post-Fukushima could push demand higher in the coming years. How much do you expect uranium demand to increase? David Talbot: We forecast uranium demand growth of about 6% compounded annually out to 2020, when we expect demand to reach about 219 Mlb. 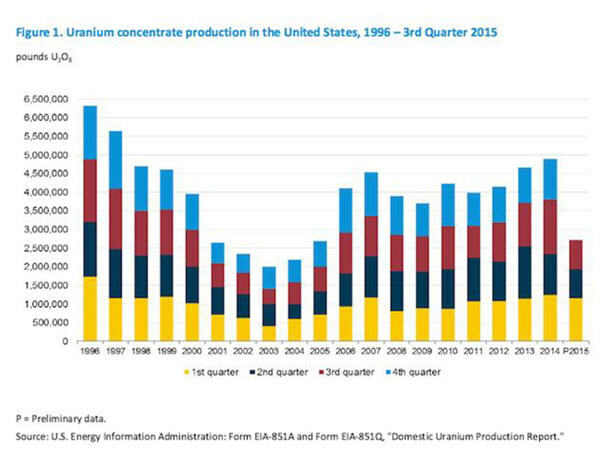 This compares to about a 4.2% compounded annual growth rate for uranium supply to about 206 Mlb over the same period. With this kind of growth, at least a $65/lb uranium price is required to develop new mines. Ux Consulting calls this an inventory-driven market, which is probably right, though not all that inventory is readily available to endusers. Stockpiles aren't growing at most power plants, but many governments are adding to their strategic stockpiles. We believe uranium market pressures will continue, and we see potential for higher spot and term prices as we move toward a significant increase in uncovered reactor requirements starting in 2017. Historically, when uranium prices move, they move quickly. It might take just one large contract to get things going, as we saw in 2010 on the back of the Chinese buying uranium from both Cameco Corp. (CCO:TSX; CCJ:NYSE) and AREVA SA (AREVA:EPA). TER: Tell us more about the supply-and-demand fundamentals for uranium. DT: Fundamentally, this sector is as solid as it has ever been, and many factors we considered earlier this year have materialized. On the supply side, there have been disruptions in recent years, such as at Ranger in Australia and Rossing in Namibia. There have been project delays, such as at Ranger 3 Deeps, and a lack of development. Underfeeding is an issue that probably adds 8–15 Mlb of supply annually to the market. And we have ongoing U.S. Department of Energy inventory sales. The demand picture is a bit rosier. According to the World Nuclear Association, there are 439 nuclear reactors in operation, 64 under construction and 154 more planned. Japanese restarts continue, albeit slowly. China's resurgence is gaining momentum as it sells reactors, services and financing abroad. New customers continue to add to Russia's order book, which we estimate to be over $1 billion. Even India seems to be inching closer to deals with Russia and China that might see these governments accepting the liability laws currently in place in India. Everything is going in the right direction. TER: Many utilities have changed their uranium buying patterns given the recent oversupply in the market. Now that supply is tightening, how do you expect utilities to react? DT: This is important. Utilities have not been contracting uranium, and that's something that has to change. Over the past three years, only 35% of the uranium consumed in nuclear reactors has been replaced by utilities. That's about 180 Mlb that was contracted versus the 510 Mlb that was used over the same period. We expect this to put pressure on utilities to replace expiring long-term contracts, especially as 2017 approaches. Positions taken over the 2005-2010 period of heavy contracting continue to influence buying behavior. Many of these contracts have had 5-, 7- or 10-year terms, so new contracts haven't been required. Spot buying was largely discretionary, and both spot and term uranium prices retreated. Security and diversification of supply were key themes during those heavy contracting periods. That is still a large part of the picture, but this time around, real demand for new reactor growth is playing a more important role, particularly in Asia and in the Middle East. TER: Could a dramatic rise in the spot price put too much uranium back into the market too quickly? DT: Lower uranium prices have moved investors away from the sector, but when the price turns, it often happens quickly. So investors come back in, and the stocks rebound quickly. But should we see rapid price growth, it's unlikely that we'll see a flood of new uranium hit the market quickly. Prices were much higher from 2006–2011. During that period, Paladin Energy Ltd. (PDN:TSX; PDN:ASX; Buy-rated with a CA$0.50 target price) started only two mines. Almost 90% of new production came from low-hanging fruit in Kazakhstan. That said, much of the last uranium rally simply saw project accumulation and resource growth with little focus on building new mines. Some companies chose not to sell fixed-price contracts and that meant they were exposed to price declines, and the best thing for them might be to halt production or project development. But these companies typically have high leverage and may be able to rebound quickly when prices rise. TER: What are some market echoes of lower uranium prices? DT: Lower prices have meant a push toward lower-cost production, namely in-situ recovery (ISR) mining. ISR mining in the U.S. can easily ramp up at operations already owned by Energy Fuels Inc. (EFR:TSX; UUUU:NYSE.MKT; EFRFF:OTCQX; Buy-rated, CA$8.35 target price), Ur-Energy Inc. (URG:NYSE.MKT; URE:TSX; Buy-rated, CA$1.75 target price), Uranium Energy Corp. (UEC:NYSE.MKT; Buy-rated, US$4 target price) and newcomer Peninsula Energy Limited (PEN:ASX; Buy-rated, AU$1.80 target price). Energy Fuels' conventional mines in the southwestern U.S., which were placed on care and maintenance as uranium prices fell down below $60/lb U3O8, could likely see operations resume when prices climb above that level again. TER: We have seen some merger-and-acquisition (M&A) activity in the uranium space. Do you expect further M&A as companies try to position themselves for higher uranium prices? DT: On the company level, increased consolidation, especially in the U.S., has been a theme. The longer the mining equity market remains under pressure, the more common these mergers will become. Energy Fuels and Uranerz Energy Corp. combined this year, as did Anatolia Energy Corp. (AEK:ASX) and Uranium Resources Inc. (URRE:NASDAQ). And Denison Mines Corp. (DML:TSX; DNN:NYSE.MKT; Buy-rated, CA$2.10 target price) and Fission Uranium Corp. (FCU:TSX; Buy-rated, CA$2.50 target price) attempted but ultimately failed to merge. As access to capital becomes more challenging, consolidation is one way to strengthen balance sheets and decrease risk. Companies are now divesting noncore assets as a source of capital. It's not necessarily about becoming bigger. Business combinations or asset purchases have become more strategic, and we expect those trends to continue. TER: What about at a macro level? DT: On a macro level, in past years the Russian Arms group acquired a large producer in Uranium One Inc. (UUU:TSX); it also acquired Mantra Resources Ltd. Chinese utility CGN Mining Co. Ltd. (1164:HK) purchased Extract Resources Ltd. for its Husab mine; and Chinese utility China National Nuclear Corp. (CNNC) bought 25% of Paladin's Langer Heinrich mine. Now, CNNC is seeking to buy part of AREVA. CNNC potentially recapitalizing the struggling nuclear giant could help AREVA's uranium business and escalate M&A activity. CNNC is known to seek Canadian projects and 25% of AREVA's production is from Canada. As these large, government-owned end users get larger, it could really escalate security-of-supply tensions. If the CNNC investment in AREVA is successful, we expect AREVA, the world's second-largest uranium producer, will likely grant China preferential treatment for its uranium production, potentially reducing uranium supplies for other utilities and increasing competition for good uranium projects. Most recently, CGN has agreed to purchase about 20% of Fission Uranium at the corporate level. TER: The Denison-Fission deal is dead for now, but is it dead forever? DT: We don't expect either party to pursue this deal further right now. The combination made a lot of sense—access to a different style of investor, allowing Denison's development staff to advance Fission's Patterson Lake South (PLS) project, granting access of Denison's massive exploration portfolio to Fission's extremely successful exploration team, to name a few. Simple one- or two-asset stories have performed better in this market versus more complex stories, and certainly the Denison-Fission merger would have added a layer of complexity. TER: Fission has outlined about 105 Mlb of uranium at PLS. It has about $10 million ($10M) left in working capital. What's the next catalyst? DT: As previously mentioned, CGN is attracted to this asset and it plans to buy almost 20% of Fission Uranium to gain a foothold in the PLS project. This is the second-largest undeveloped project in the Athabasca Basin, but that resource estimate is now about a year old. Fission continued to drill it last winter and through the summer, and has added meaningful pounds at the R600 West and R780 zones. Fission is planning a $7M, 11,000-meter (11,000m) winter drill program that will focus on 600 West and parallel zones north of that. The goal is to add some land-based resources to lower costs and improve the mine plan. CGN's involvement may accelerate the development process. TER: What were your thoughts on the maiden resource on the Gryphon zone, part of Denison's Wheeler River property? DT: Denison essentially added 43 Mlb at 2.3% U3O8. We expected something in the 30 Mlb range. It increased Wheeler River's resource by about 60% to 114 Mlb. Wheeler River is now the Athabasca's largest undeveloped uranium project, and it's closer to infrastructure on the east side of the basin, including the McClean Lake mill, which Denison has an interest in. In turn, the Gryphon resource has large implications for the economics at Wheeler River, when combined with the Phoenix deposit. Phoenix is the world's highest-grade uranium deposit at 70 Mlb grading 19% Indicated, 1.1 Mlb at 5.8% Inferred. Gryphon could be accessed earlier, while Denison develops the more challenging, unconformity-style Phoenix project. TER: What are some other companies with promising uranium projects in the Athabasca region? DT: We have a Buy recommendation and a $25.30/share target price on Cameco. The company has blown through guidance this year at the Cigar Lake mine, where we estimate it will produce 10.7 Mlb U3O8, and 27.3 Mlbs overall in 2015. It was originally expected to produce between 6 and 8 Mlb at Cigar Lake. It's producing roughly 1.4 Mlb per month or about 16.8 Mlb per year and that's already 93% of capacity, which it did not plan to achieve until 2018. Cameco trades at about 6.7 times price to cash flow, about 56% of its historical average, yet the market has been shunning Cameco. It's down 13% since Q1/15. There is some Canada Revenue Agency tax dispute risk, but otherwise this is a blue-chip name. TER: What are some others? DT: We recently increased Laramide Resources Ltd. (LAM:TSX; LAM:ASX) to a Buy rating with a CA$0.80/share target upon news that it was set to acquire Uranium Resources' Church Rock and Crownpoint ISR projects in New Mexico. The company is also planning to roll over near-term debt and remove a royalty, which would improve the economics of a project it is purchasing. We see the potential for low-cost, U.S.-based ISR production as a significant derisking event for Laramide. Upon closing, its resource base would be among the highest of the U.S. ISR peers. These projects are advanced, near infrastructure and permitted for production. Upcoming plans are to pay off debt, consolidate resources and complete a feasibility study contemplating production of the entire area. We also recently upgraded Berkeley Energia Ltd. (BKY:LSE; BKY:ASX) to a Buy rating with a AU$2/share target following the release of its latest prefeasibility study on its Salamanca project in Spain. The prefeasibility study demonstrated impressive economics once the high-grade Zona 7 deposit was incorporated into the Spanish project. Zona 7 now moves forward in the mine plan, nearly doubles production over earlier forecasts, and decreases initial capital and operating costs. A production decision has been made and final permits are expected by mid-2016. In the event of successful financing, construction would break ground soon thereafter. Peninsula Energy is checking off four huge milestones expected by year-end, with the recent Nuclear Regulatory Commission license approval to begin operations at its Lance project in Wyoming. Getting this approval within one month of a site inspection is impressive. As an emerging producer, we expect Peninsula to get a rerating, which might already be underway as it has the largest market cap of any of the U.S. uranium producers. Upcoming near-term milestones include production by year-end, another offtake agreement, which should allow phase 2 expansion, and a U.S. listing. And, finally, Ur-Energy is one of the leading U.S. ISR producers. The stock is definitely on a roll this month following good quarterly results and an excellent resource upgrade. It continues to hit its production targets and its already low costs are expected to decline further. Unlike other producers in the sector, these lower costs in the U.S. come without the help of currency fluctuations. It has the highest realized prices among all producers at above $56/lb, a 55% premium to the current spot price. TER: What about some downstream developers? DT: Three of the earlier-stage names include NexGen Energy Ltd. (NXE:TSX.V; NXGEF:OTCQX), UEX Corp. (UEX:TSX) and Kivalliq Energy Corp. (KIV:TSX.V). We recommend NexGen Energy with a Buy rating, and no target price. As it drills its Arrow zone discovery on the Rook 1 project, NexGen continues to report some of the thickest and highest-grade uranium intercepts found this year in the Athabasca Basin. It is expanding a newly identified, high-grade core within the A2 Shear. This core alone could host over 60 Mlb U3O8. Further drilling suggests a similar high-grade core on the A3 Shear. There are plenty of catalysts to drive NexGen into 2016—ongoing drill results, an initial resource estimate and another aggressive winter drill program to test high-priority targets. The recent CGN investment in Fission, next door, was also good for NexGen's share price, as it demonstrated that the large end users have given a stamp of approval to the western Athabasca Basin. We wouldn't rule out utilities having a similar interest in NexGen's Rook 1 project. TER: Is the A2 subcore mineable given its somewhat irregular shape? DT: Irregular shapes in mining are typical. What is important is that the deposit is predominantly vertical. This could allow bulk-mining methods such as long-hole mining, which tends to be lower cost and lets gravity do the work. The deposit demonstrates similar geometry to Cameco's Eagle Point mine, which feeds the Rabbit Lake mill on the eastern side of the basin. It's going to take a while to completely drill off a Measured & Indicated resource at Arrow, but it's probably going to be one of the largest deposits ever found in the Athabasca Basin. Another company we recommend is UEX Corp. with a Buy rating and $0.60/share target price. UEX hosts nearly 100 Mlb at Hidden Bay and Shea Creek in the Athabasca Basin, but its recent acquisition of the Christie Lake project provides potential to add pounds quickly. Christie Lake is on the same structure as Cameco's ultra-high-grade McArthur River mine, the largest uranium mine in the world. Finally, we recommend Kivalliq Energy, with a Buy rating and no target price. All nine drill holes from summer drilling hit uranium at its new Dipole discovery in Nunavut. We see potential for Kivalliq to repeat its previous success on the Lac 50 trend, which hosts a 43 Mlb Inferred resource at 0.69% U3O8. That's one of the highest-grade resources outside the Athabasca Basin. These are typically large-scale deposits, but drilling has barely started on this Dipole zone. The nearby RIB target shows even more potential. TER: Let's move to renewable energy. How are the giant electric battery manufacturing plants being built by Tesla Motors Inc. (TSLA:NASDAQ) and others influencing demand for graphite and lithium? DT: Rechargeable lithium-ion battery megafactories being built by industry heavyweights are projected to increase global battery capacity by about 150% by 2020 to feed a fast-growing market. That includes electric vehicles, where demand has a projected 20–30% compounded annual growth rate through 2025. Just the other day, Ford Motor Co. (F:NYSE) suggested that it plans to have 40% of its entire fleet electric by 2020. Graphite and lithium are two of the key raw materials used in lithium-ion batteries. These factories will likely need at least 70 thousand tons (70 Kt) of lithium carbonate by 2021. Tesla alone will need about 35–45 Kt of flake graphite annually, and about 20–25 Kt of lithium once it's running at capacity. That's the equivalent of one mine. Benchmark Mineral Intelligence expects excess supply of graphite this year, with 400 Kt supply offset by about 375 Kt of demand. Prices are down about 15% this year to about $800–1,100 a tonne). But not all graphite is the same. Non-flake and smaller flake graphite prices have declined more so than large and jumbo flake, which are preferred by battery manufacturers. TER: Share prices for lithium producers are up in 2015, whereas share prices for graphite-focused equities have largely retreated. If the rumors are true and Apple Inc. (AAPL:NASDAQ) ventures into the electric vehicle market, would that spur a broad run on green energy equities? DT: I think so. Graphite doesn't necessarily get the credit it deserves. It is an important component of lithium-ion batteries, but that industry is more developed, and lack of demand from the steel industry has influenced prices recently. But demand is rising and competition is intensifying in the electrical vehicle market. Traditional players like Ford and Volkswagen AG (VOW3:ETR), and nontraditional players like Tesla and Apple, are starting to compete for a piece of this up-and-coming industry. Toyota Motor Corp. (TM:NYSE) has already plugged in production alongside Orocobre Ltd. (ORL:TSX; ORE:ASX). We expect the supply of raw materials such as lithium, graphite and even cobalt to tighten further. New battery market entrants may want to secure supply by having controlling stakes in mine production. That would encourage investment in lithium and graphite companies. TER: Give us an overview of the lithium market. DT: Lithium carbonate is up 15% year over year and is now priced at over $6,000/tonne. Lithium hydroxide is getting more attention and is priced between $6,000-8,000/tonne, up 25% over last year. Some industry participants have noticed that transactions for both compounds have reached about $9,500/tonne recently. The lithium market might already be at a deficit. Benchmark Mineral Intelligence pegs 2015 demand at 175 Kt of lithium carbonate equivalent, and supply at about 150 Kt; SignumBOX, another consultant, estimates that lithium demand will grow at 7.4% compounded annually through 2030, and that lithium carbonate and lithium hydroxide prices will range from $8,000–12,000/tonne by 2030. With these prices expected to rise dramatically, there ought to be lots of incentive to get projects up and running. TER: Give us your top picks in the lithium space. DT: We recently initiated coverage on Nemaska Lithium Inc. (NMX:TSX.V; NMKEF:OTCQX) with a Buy rating and a CA$1/share target. This is Canada's only significant, public lithium developer. Its world-class Whabouchi project in Québec is large and homogeneous, with high grades and low levels of impurities. The project is fully permitted and Nemaska has signed a memorandum of understanding (MOU) with London-based Johnson Matthey Battery Materials Ltd. for $12M to get its phase 1 lithium hydroxide plant running. The financing unlocks another $26M in government funding that will cover costs for three years. Construction of the phase 1 demonstration plant is a major step toward technical and financial derisking. It allows Nemaska to nail the process, attract customers, comfort investors and arrange additional project financing for phase 2, which is the full plant. Nemaska is planning to process lithium hydroxide directly from high-quality spodumene concentrate at low costs. We also recommend Orocobre with a Buy rating and AU$2.70/share target. Orocobre continues to ramp up production at its Olaroz project in Argentina. This is the first new lithium mine in 19 years. The bottlenecking program at Olaroz is progressing, and further equipment has been ordered to ensure the plant reaches capacity. That should finish by mid-January 2016 and allow the operation to ramp up to 17 Kt lithium carbonate per year. Recently, Orocobre signed an MOU with Bateman Advanced Technologies, which is a subsidiary of Tenova SPA, to develop a lithium hydroxide plant in Argentina. Management suggests potential production of 15–25 Kt per year of lithium hydroxide in addition to its lithium carbonate production. Finally, we have Western Lithium USA Corp. (WLC:TSX; WLCDF:OTCQX), with a Buy rating and a CA$1.20 target following the merger with Lithium Americas Corp. This company has a lithium brine project in Argentina, a hectorite clay project in Nevada and a new organoclay operation serving the oil and gas and agricultural industries in Nevada. Its Cauchari brine project is advanced, and negotiations are underway with POSCO (PKX:NYSE) to form a joint venture that would supply Western Lithium with a proprietary lithium extraction process and see a demonstration plant built next year, completely funded by POSCO. TER: What types of graphite equities are most likely to perform in the near term? DT: Junior mining companies often perform better when their flagship assets are high grade. That's one reason we like Mason Graphite Inc. (LLG:TSX.V; MGPHF:OTCQX). The company has the attributes to create good flake material at its Lac Guéret project in Québec. A recent feasibility study suggests large, long-life, low-cost graphite production at about 50 Kt per year, which should help it pass financial due diligence. Project economics were helped by a weaker Canadian dollar, marginally higher production and longer mine life despite higher capital costs for the operation. We expect financing risk to be the key here. We also expect a marketing risk, especially because Mason has over 50 Kt of material to sell annually. We rate the company a Buy, with a CA$0.90/share target price. TER: Does Mason Graphite have the right people in place to develop a graphite mine in Québec? DT: We think so. Management at Mason has extensive experience in graphite processing, marketing and distribution. That's likely why this company will get financed before others. CEO Benoit Gascon was CEO of StratMin Global Resources Plc (STGR:AIM), which operates one of North America's few graphite mines. He has extensive knowledge of the market, and numerous relationships with buyers. Luc Veilleux, executive vice president and chief financial officer (CFO), has eight years at Timcal as its CFO and chief operating officer, vice president of finance for North America and controller for the Lac-des-Iles graphite mine. Jean L'Heureux, a professional metallurgical engineer, has been mining and processing graphite for 20 years. TER: What's your advice to investors seeking to capitalize on the current market? DT: Don't put all your eggs in one basket. You should invest in various companies of various sizes and at different stages of development. We also suggest you look at a suite of minerals, like lithium, graphite and cobalt. And look at uranium, too. Nuclear power is an important clean air and baseload power source. Electric vehicles provide no benefits if the electricity to charge the batteries comes from dirty sources. TER: Thank you for your insights, David. Dundee Capital Markets Vice President and Senior Mining Analyst David A. Talbot worked for nine years as a geologist in the gold exploration industry in northern Ontario with Placer Dome, Franco-Nevada and Newmont Capital. Talbot joined Dundee's research department in May 2003, and in the summer of 2007, he took over the role of analyzing the fast-growing uranium sector, and currently covers uranium, lithium, graphite and iron ore. Talbot is a member of the Prospectors and Developers Association of Canada and the Society of Economic Geologists, and graduated with distinction from the University of Western Ontario with an Honours B.Sc. degree in geology. 2) The following companies mentioned in the interview are sponsors of Streetwise Reports: Nemaska Lithium Inc., Energy Fuels Inc., Fission Uranium Corp., Mason Graphite Inc., UEX Corp. and NexGen Energy Ltd. The companies mentioned in this interview were not involved in any aspect of the interview preparation or post-interview editing so the expert could speak independently about the sector. Streetwise Reports does not accept stock in exchange for its services. 3) Dundee Capital Markets has provided investment banking services to NexGen Energy Ltd., Denison Mines Corp., Fission Uranium Corp., Uranium Energy Corp. and Western Lithium USA Corp. in the past 12 months; Dundee Capital Markets and its affiliates, in the aggregate, beneficially own 1% or more of a class of equity securities issued by Energy Fuels Inc.; a research analyst/associate involved in the preparation of this research report beneficially owns, has a financial interest in, or exercises investment discretion or control over, securities issued by: Kivalliq Energy Corp. and Fission Uranium Corp.; a research analyst/associate involved in the preparation of this research report has visited certain material operations of the following issuer(s): Laramide Resources Ltd., Berkeley Energia Ltd., NexGen Energy Ltd., UEX Corp., Kivalliq Energy Corp., Fission Uranium Corp., Denison Mines Corp., Ur-Energy Inc., Peninsula Energy Ltd., Nemaska Lithium Inc., Western Lithium USA Corp., Mason Graphite Inc., Cameco Corp., Paladin Energy Ltd., Energy Fuels Inc. and Uranium Energy Corp.; the research analyst/associate and/or Dundee Capital Markets has been partially reimbursed for expenses or partial expenses were paid for by the following issuer(s) for travel to material operations of the issuer(s): Laramide Resources Ltd., Berkeley Energia Ltd., NexGen Energy Ltd., UEX Corp., Kivalliq Energy Corp., Fission Uranium Corp., Denison Mines Corp., Ur-Energy Inc., Peninsula Energy Ltd., Nemaska Lithium Inc., Western Lithium USA Corp., Mason Graphite Inc., Cameco Corp., Paladin Energy Ltd., Energy Fuels Inc. and Uranium Energy Corp.